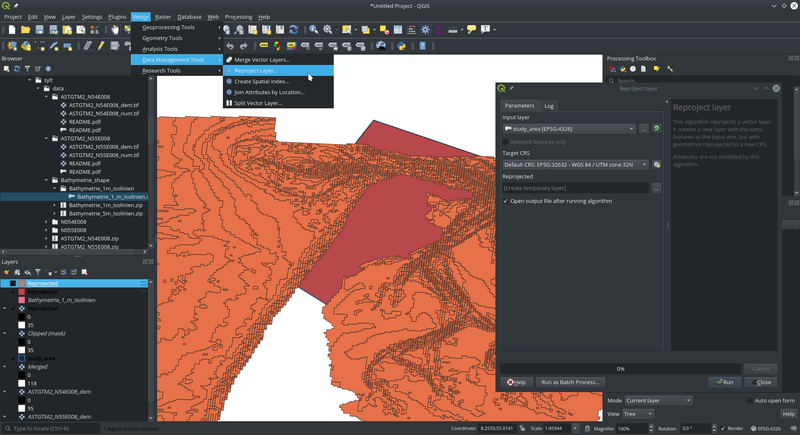 This documentation describes an exemplified workflow to create a groundwater flow model based on available data of a digital elevation model (here SRTM data) and bathymetry data (here GPDN). 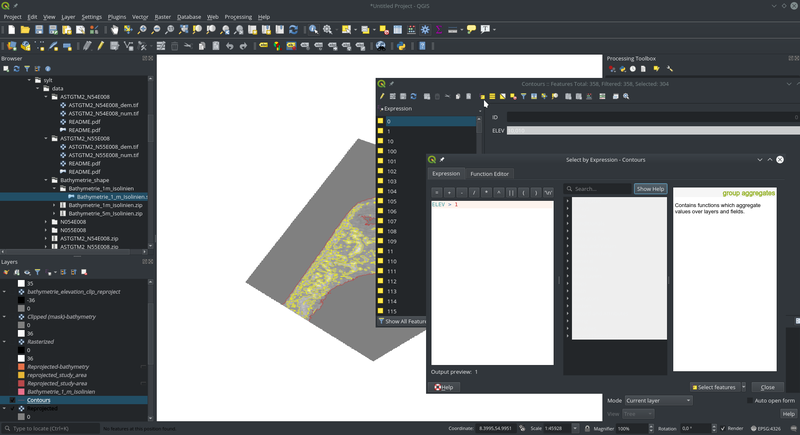 As tools, it uses a GIS (here QGIS), the OGS DataExplorer and several OGS tools, as well as the meshing tool GMSH and visualization tool ParaView. The first part of this documentation deals with the GIS work, the second with the OGS model setup. This part will prepare the DGM and bathymetry data as input for the model setup. 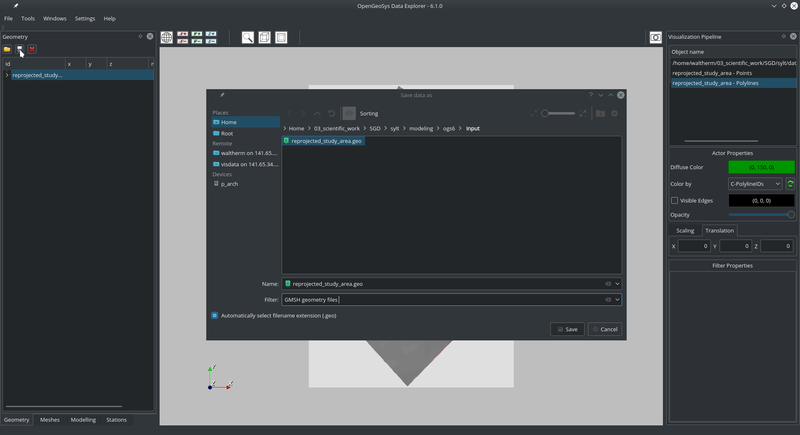 For all the QGIS editing steps, you may additionally define an output file (but this is no requirement); if this is not defined, QGIS will load the results into the active project. 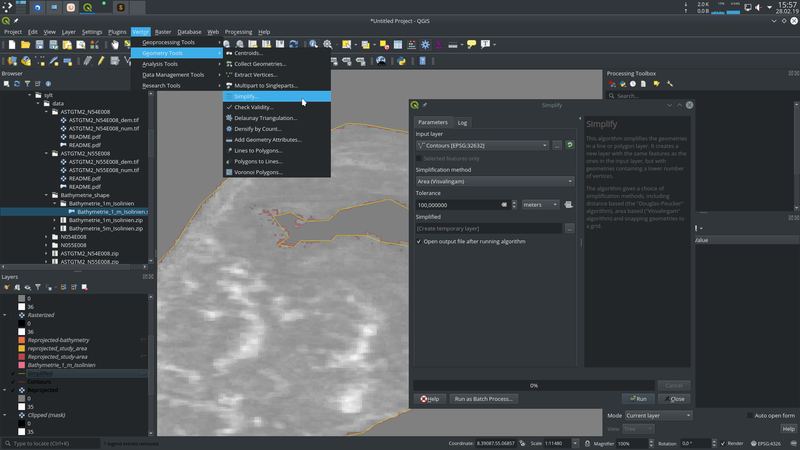 It is likely that you will need to download more than one remote sensing image when the study area is large or overlapping the borders of one section. Download the required DGM data (here .tif files) of the study area and load them into QGIS. 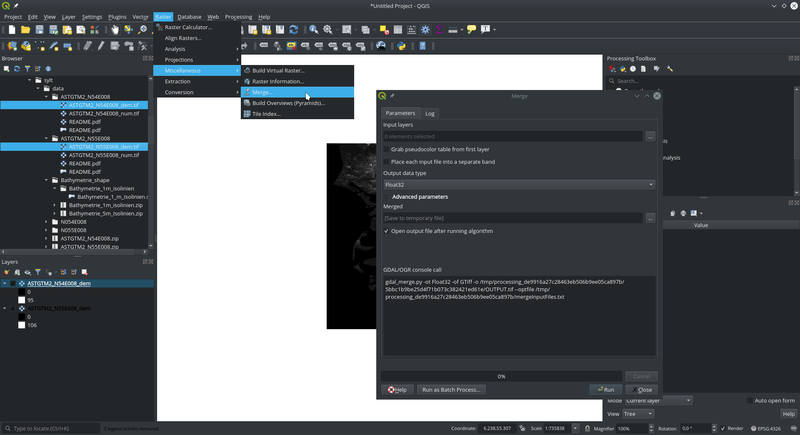 Merge the images with Raster -> Miscellaneous -> Merge...; select the Input Layers. 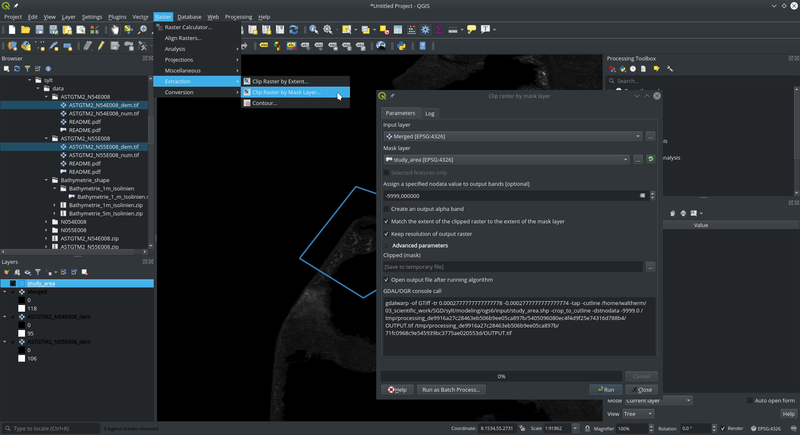 Extract a subregion of the (merged) DGMs and define the study area through a shape file. One may also use a predefined shape file and continue with step 5. Choose New Shapefile Layer... from the toolbar and enter a File name and a projection. Edit the shape (Toggle Editing in toolbar), add points, and save the layer edits. 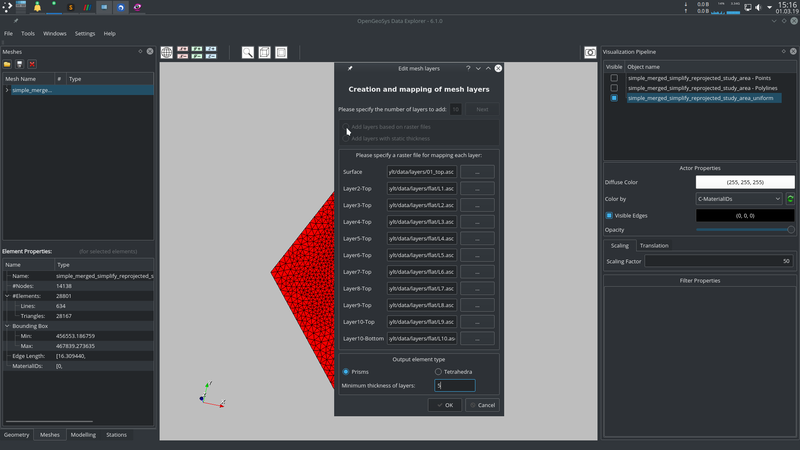 Clip the DGM with the shape file with Raster -> Extraction -> Clip Raster by Mask Layer...; define Input Layer and Mask layer, and assign the Nodata value. 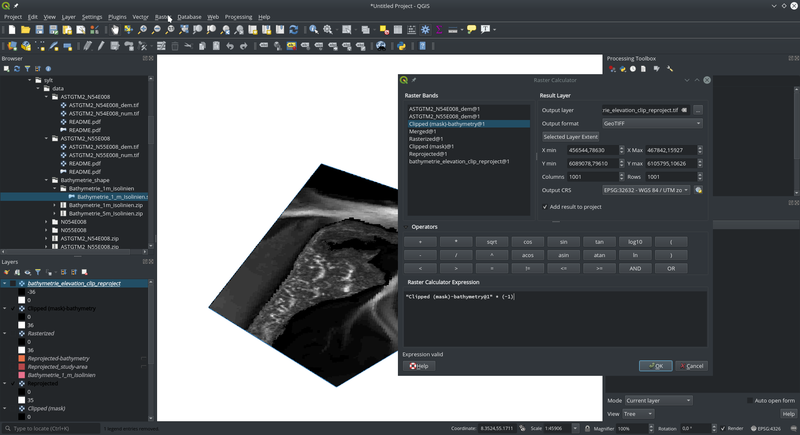 If the raster does not have the correct projection, you will have to reproject it with the appropriate target system with Raster -> Projections -> Warp (Reproject); select the Input Layer and the Target CRS. 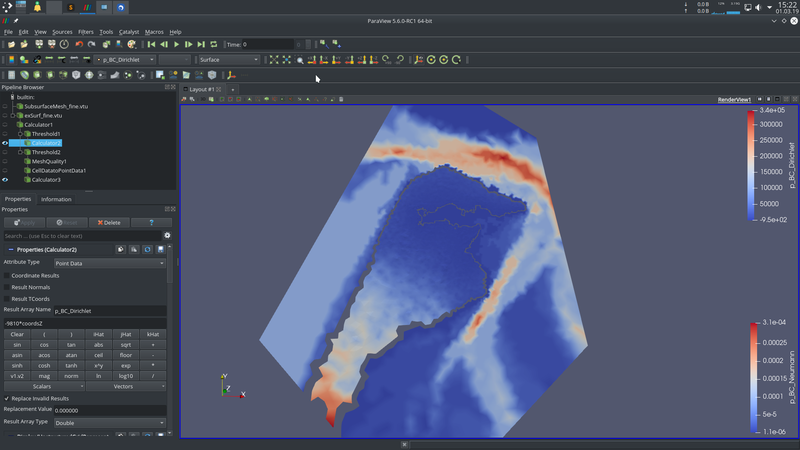 This example also includes bathymetry data, which was available as vector data (isoline in a shape file). 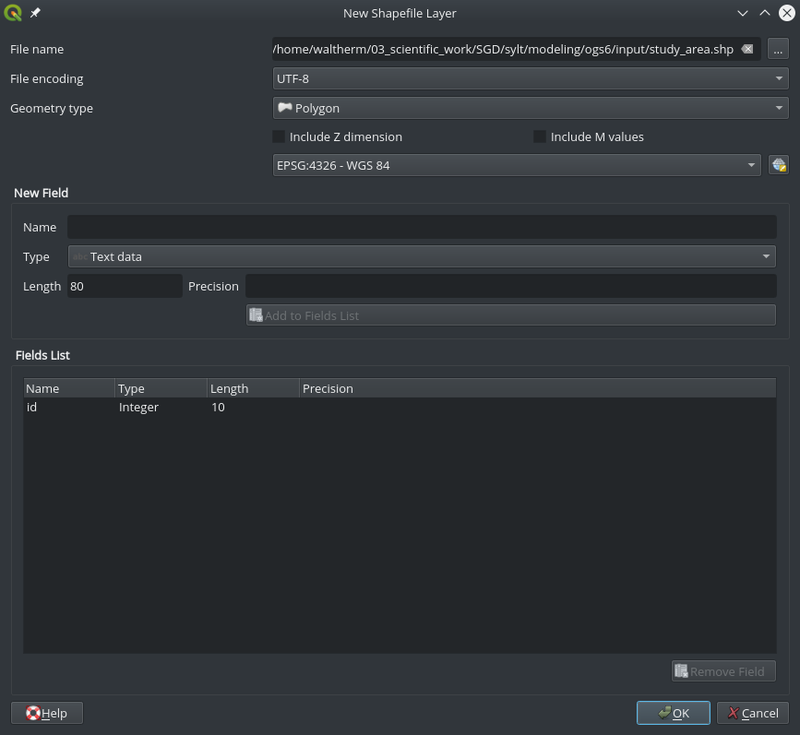 This file must be reprojected to the same coordinate system as the raster before with Vector -> Data Management Tools -> Reproject Layer; select Input Layer and the Target CRS. 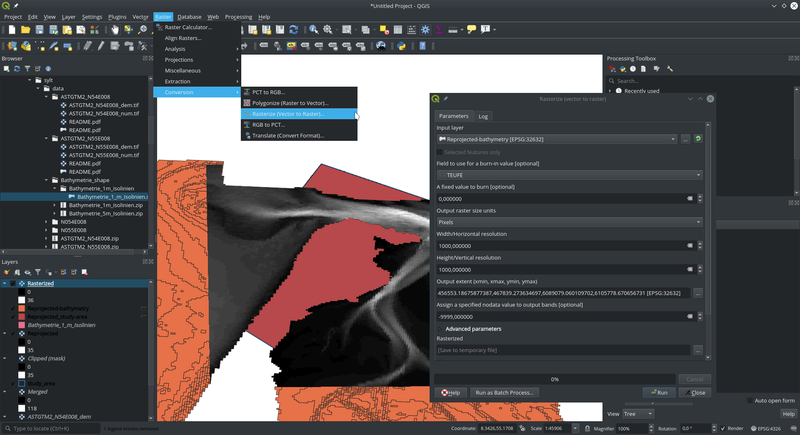 Before merging DGM and bathymetry, the shape data needs to be converted to raster data with Raster -> Conversion -> Rasterize (Vector to Raster); define Input Layer, the z-value (burn-in value), the resolutions, and the nodata value. 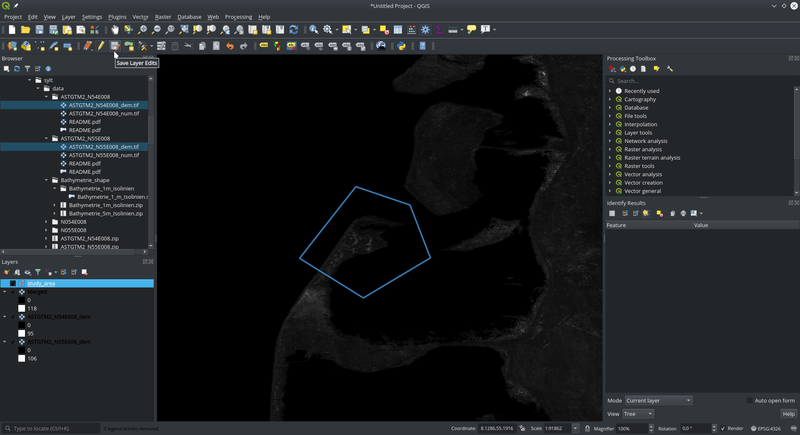 As bathymetry was given as “depth”, this parameter needs to be converted to an “elevation”; use Raster -> Raster Calculator and define the Output layer, the Output format and the Raster Calculator Expression (shown formula only inverts the sign). 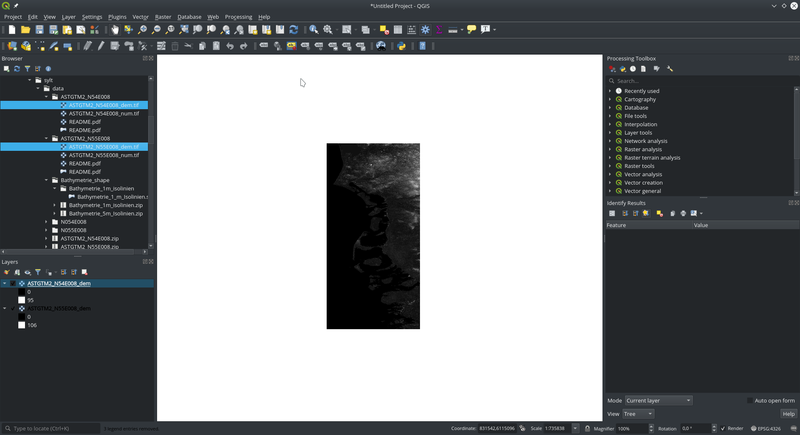 Merge the DGM and bathymetry rasters (as done in step 2), and save the merged file as a .asc file with Raster -> Conversion -> Translate (Convert Format); define the Input Layer and the Converted output file. 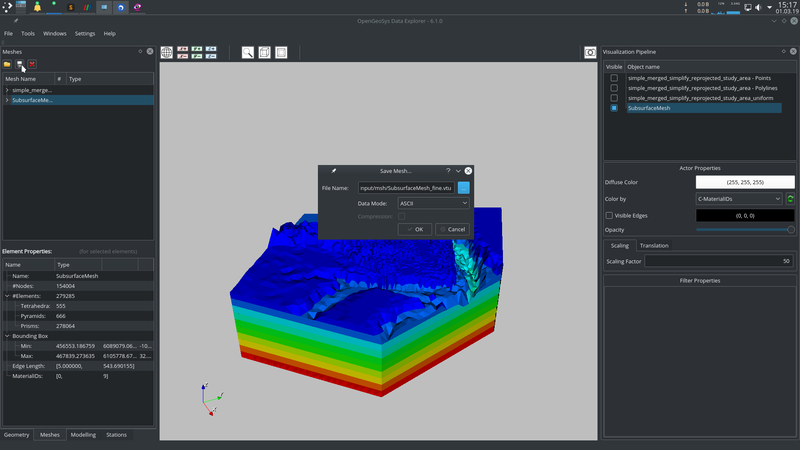 To make the coastline part of the mesh, the merged DGM-bathymetry will be used to create a contour isoline at an elevation of 0.01 m with Extraction -> Contour...; select the Input Layer, set the Interval between contour lines to a high value and set the Offset from zero. 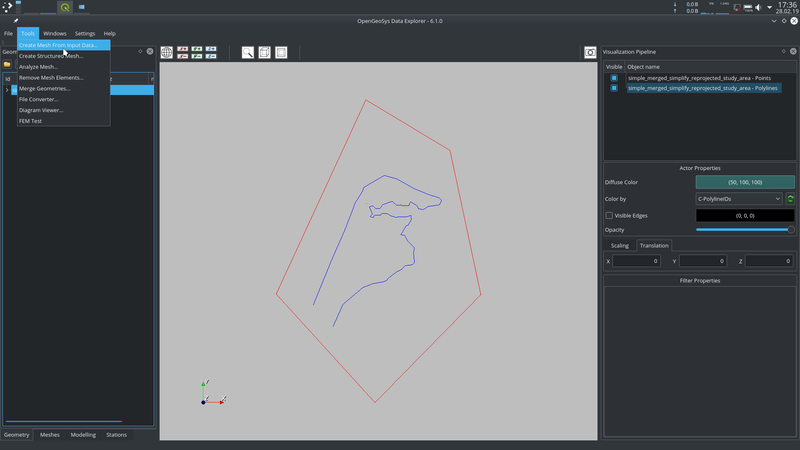 If more than the 0.01 m contour is present in the new shape file, remove the not required contours by right-clicking the new shape file and Open Attribute Table; click Select features using an expression and define the contours based on your liking that you want to exclude (here, anything with an elevation larger than 1 is removed). Finish the selection (close attribute table) and remove the selected features by editing the shape (Toggle Editing) and clicking Delete Selected; save the changes. 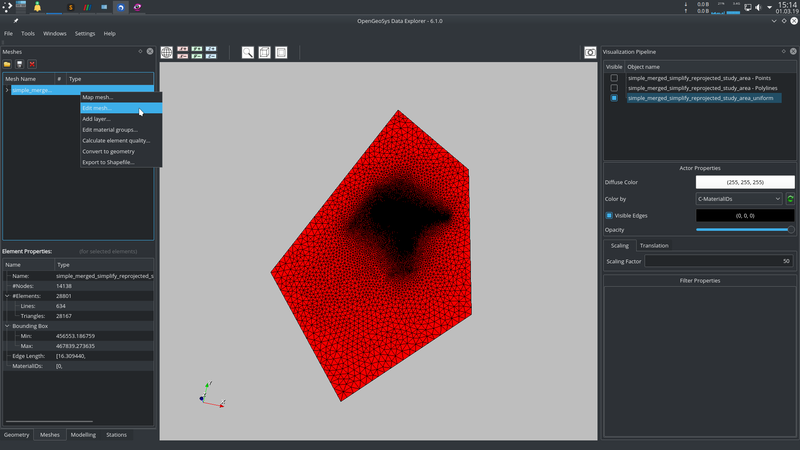 The remaining features may be too highly resoluted (see red line in below figure); choose Vector -> Geometry Tools -> Simplify..., and select an Input Layer as well as the Simplification method with an appropriate Tolerance. Further, it might be useful to manually remove even more vertices from the polygon; Toggle Editing of the simplified shape and select and remove vertices. The shape file used to clip the study area in step 5 will be used as the boundary of the model setup and be combined with the coastline. 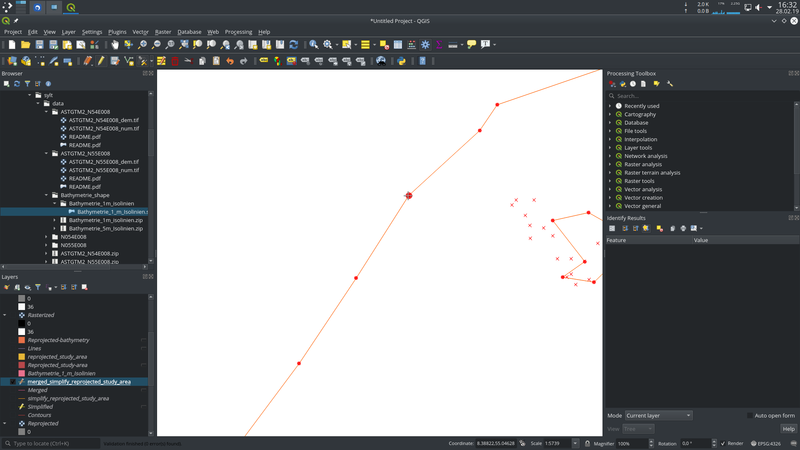 Firstly, convert the polygon of the study area to a polyline with Vector -> Geometry Tools -> Polygons to Lines; select the Input Layer. Before merging the boundary and the coastline shapes, remove all fields from the boundary polyline through the Attribute Table; select everything and click Delete field. 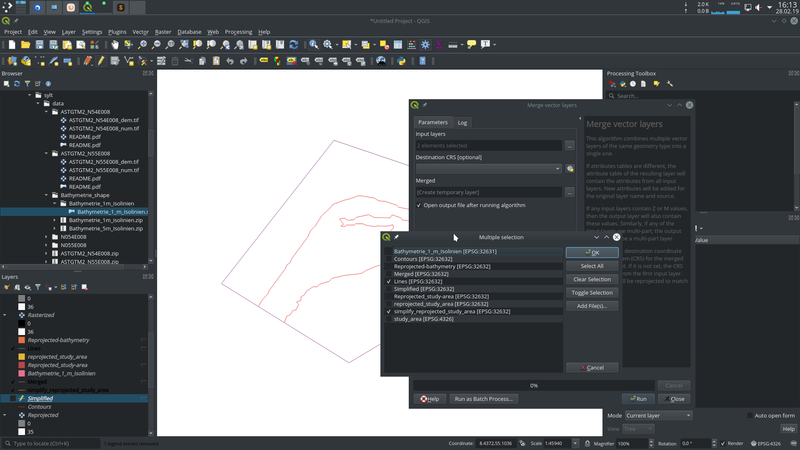 Merge the boundary polyline and the coastline with Vector -> Data Management Tools -> Merge Vector Layers; select Input Layers. 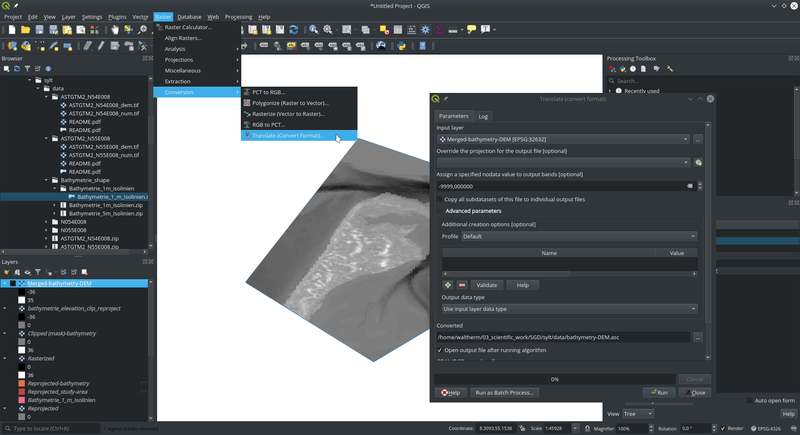 The next steps will use the OGS DataExplorer, GMSH, and ParaView to prepare the model input files. 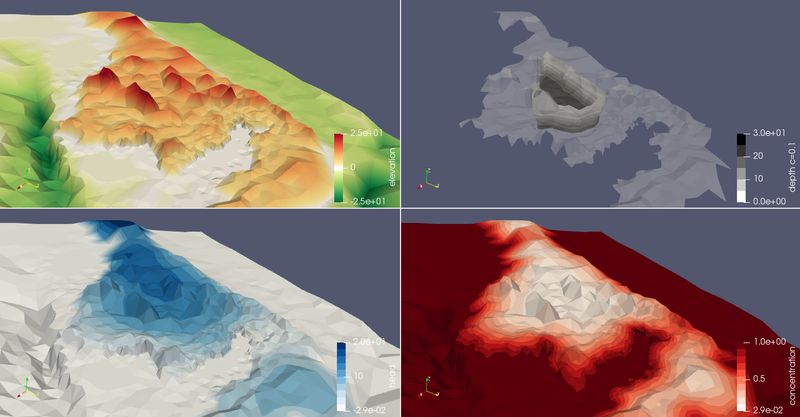 A 2D mesh will be generated from the merged shape file containing the study area boundary and the coastline; the elevation data will be used to define the surface of the model and subsurface layer information will be used to define the aquifer structure. 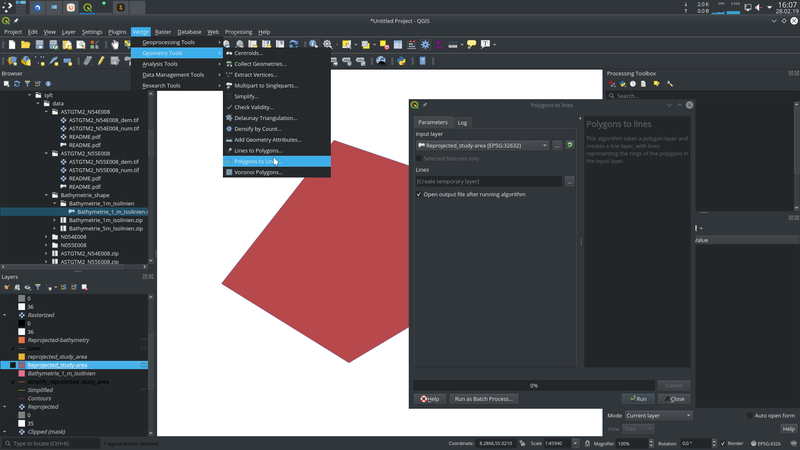 From the dialogue, select the geometry which should be used and let it show up on the right side (Employed information). 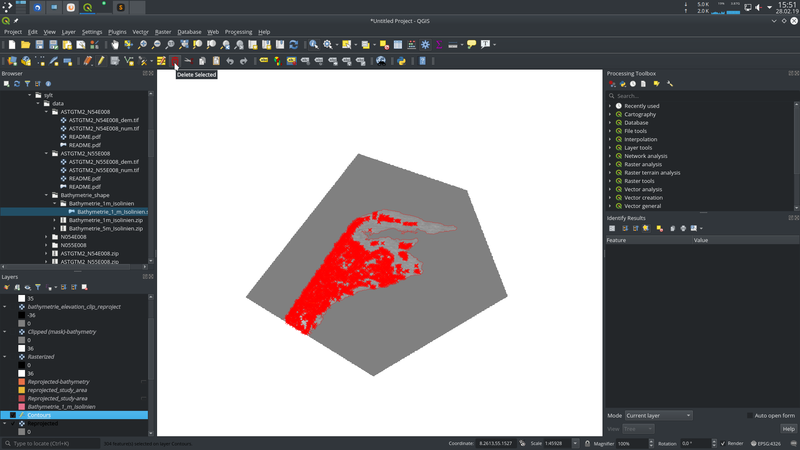 Select the Advanced tab, choose Adaptive meshing, and remove the tick at Delete GMSH geo-file after generating mesh (in case you still want to manipulate the .geo file); click OK. In the new dialogue, Specify the number of layers to add (here 10), click Add layers based on raster files, and load all .asc files that define the different layers into the interface. Also, define a Minimum thickness of layers (here 5 height units). 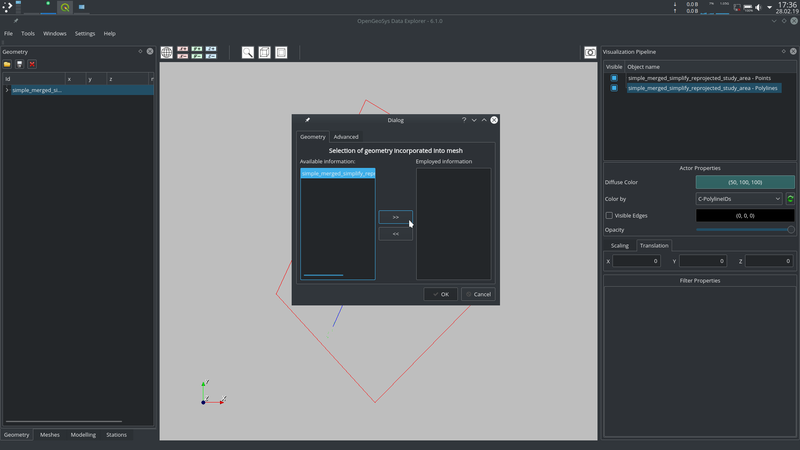 For the creation of the boundary conditions, use the following workflow. Save the created 3D mesh as a .vtu file by selecting the 3D mesh in the Meshes tab and clicking the save icon. 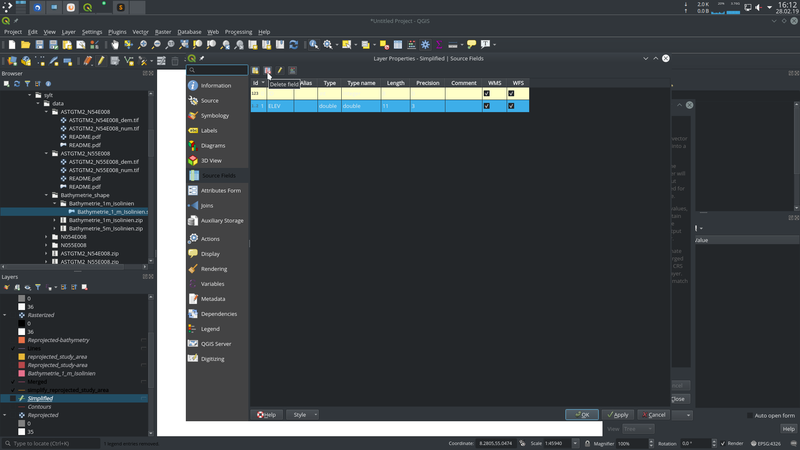 In the new dialogue, choose a output directory, filename, and the Data mode. 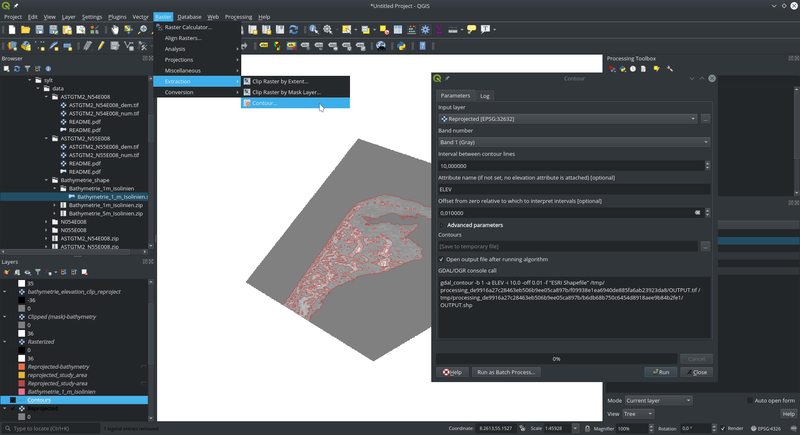 Apply a Calculator with the operation coordsZ to get a new parameter field with elevation data. Apply a Threshold and define the value range from the lowest to the water level (here -35 to 0.01 height units); this will be the input file for the Dirichlet boundary condition. Apply a Calculator with the operation -9810*coordsZ (i.e. fluid density multiplied by gravity by elevation) to get a pressure gradient. repeat b) and c) on the Calculator from a) but with the value range water level to highest value (in the Threshold), and define the recharge value for the land area (in the Calculator). Save the “land” and “water” meshes as .vtu files. 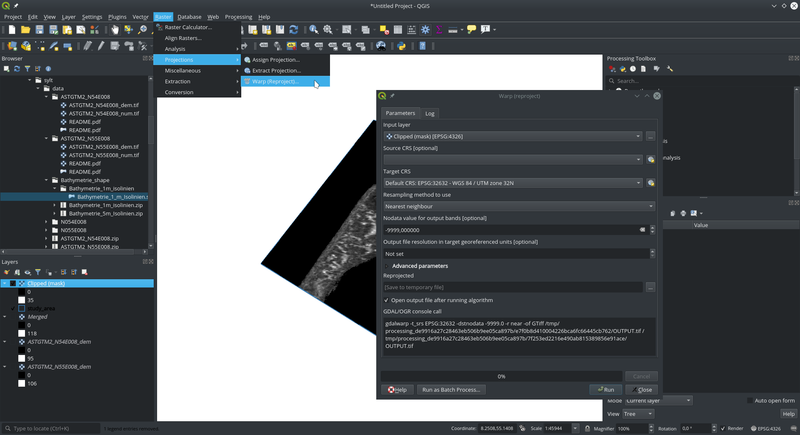 Define the .prj file of your setup, including the 3D mesh and boundary condition meshes and run the simulation.